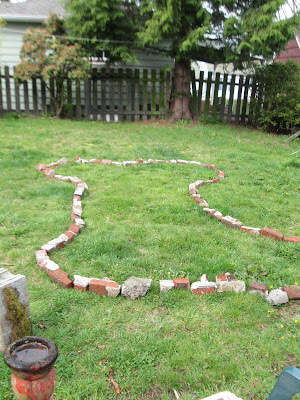 Just a girl with a hammer: Garden fever! I officially have garden fever. I've checked out pretty much every book on gardening in the library where I work. At night I pile into my bed with my books and my sketches and plot. This is exactly what I needed to jolt me out of my homeowner ennui. 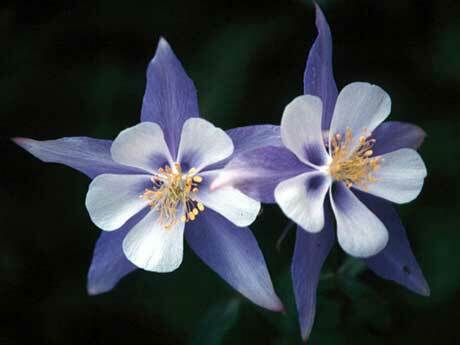 Last weekend I planted four more peonies and put a columbine in the shade garden. I planted an Ocean Spray in the back right corner. 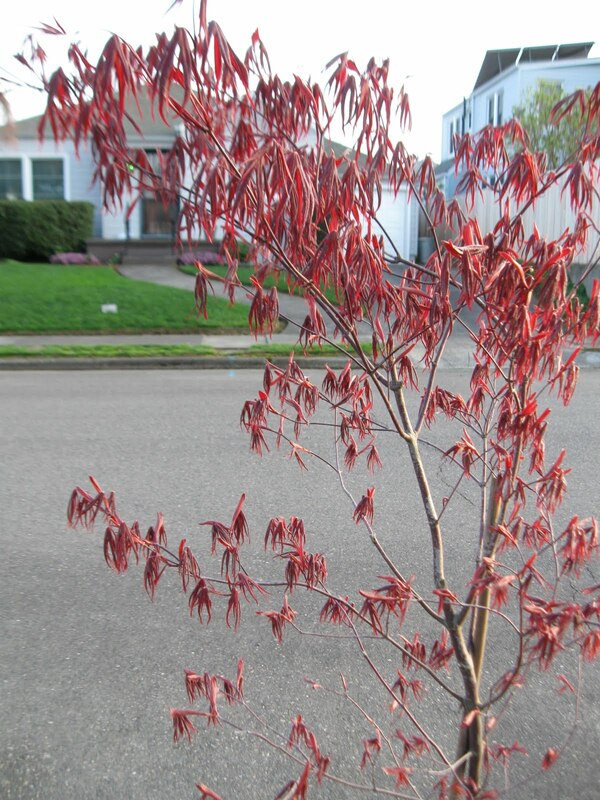 Ocean Spray is a native plant which means it's low-maintenance. No mulching, no pruning, no soil amendments, just plant them somewhere they can go nuts. Ocean Spray can get to be 15 feet tall and wide, so it should screen out the neighbors behind me as well. God, is my yard a mess or what? 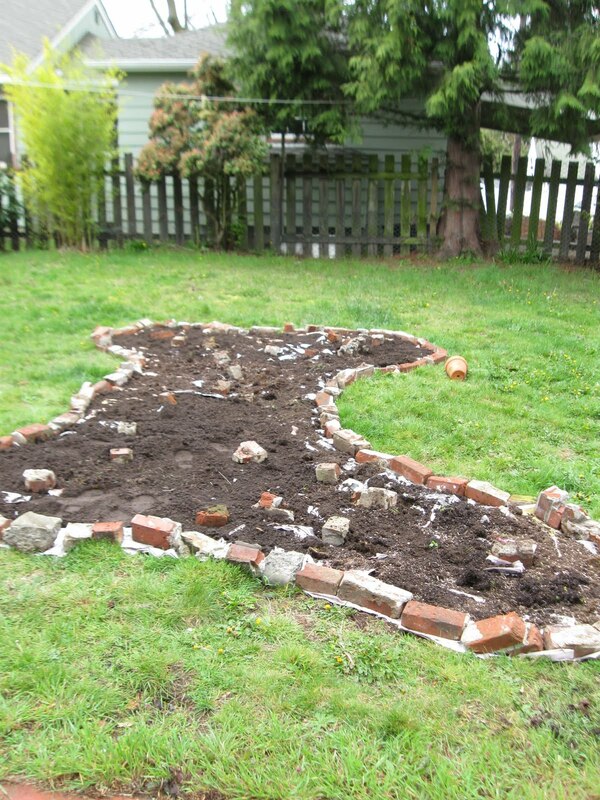 In addition to screening out the neighbors (a new fence should help, too), I want to put in raised vegetable beds. 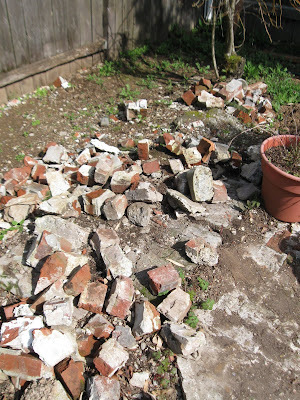 I have a completely annoying brick heap in my yard, presumably left over from a bricked barbecue. I started grabbing bricks and laying out where I want to put the bed. 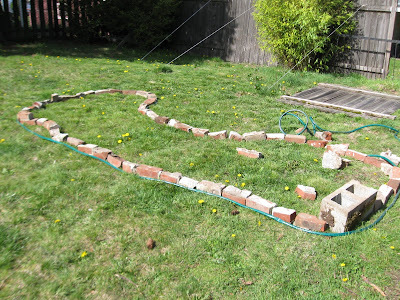 But I kept wanting to change the shape and that got really tiring, moving bricks over and over, so I finally got smart and pulled out the hose. 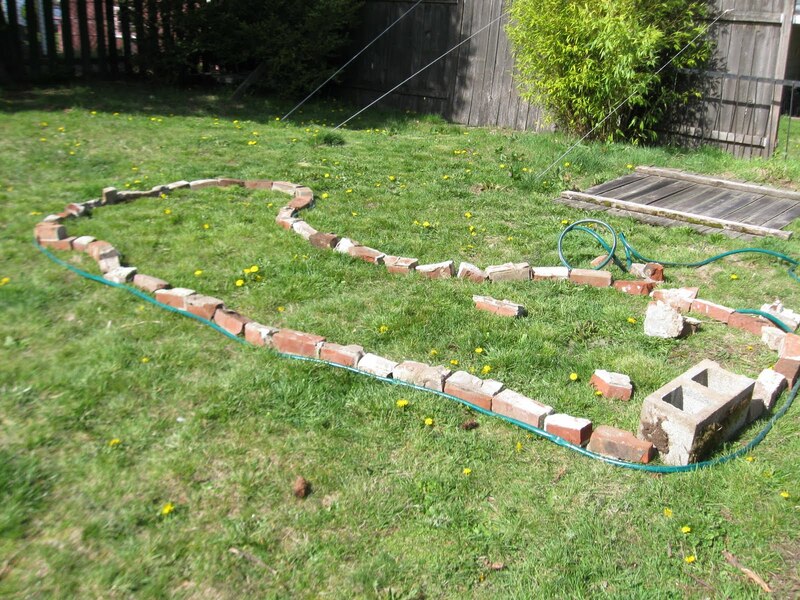 Once I had a shape I liked I moved the bricks. I ended up with a modified bone shape. My sister said it looks more like a shark or a boot. I was encouraged by my friend T to do sheet mulching. Some people call it "lasagna mulching." You lay down newspaper or cardboard to choke out the grass, then pile on mulch and organic material. You kill off the grass but maintain all the bugs and bacteria and established naturey goodness in the soil. And you keep piling and piling until you have nice soil to plant your veggies in. I asked one of coworkers to save the newspapers the next time she cleared out the library periodicals room. 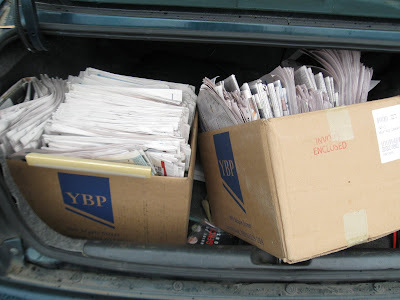 That very same day I had two huge boxes of newspapers! I did this on a rainy day, which worked to my advantage (wet newspaper doesn't fly away). 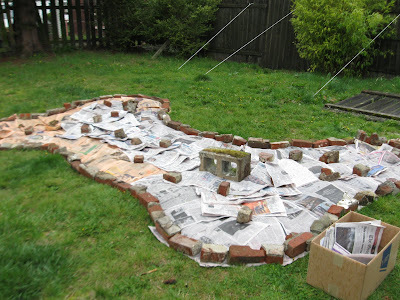 You just spread out a thick layer of newspaper (between 5-20 pages said one website) and grab some bricks so they don't fly away . . .
Then I grabbed some of the soil from the various pots I had all over the patio and spread it on top. The next time I mow the lawn I'll use the bag (I usually don't) and spread the collected clippings on top. I'll start collecting compostable materials like kitchen scraps and throw those on too. 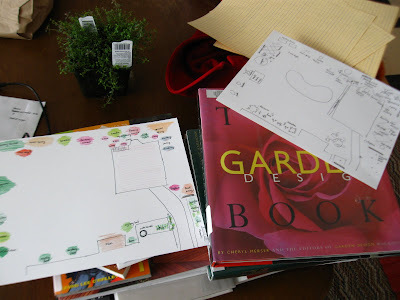 Then hopefully I'll figure out what material I want to use to raise the beds and I can start getting my veggies going before we get too long into spring. 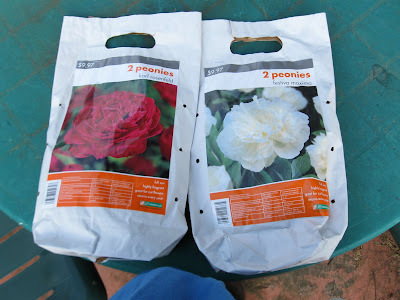 I also planted ranunculus bulbs and sowed sweet alyssum beneath the rose bushes out front. 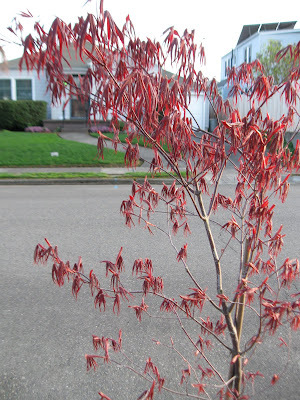 The maples in the front are leafing out and the color is gorgeous. I'm planning on planting creeping thyme beneath them. It should provide a nice ground cover that has the bonus of releasing a wonderful smell when it's stepped on. So as my roommate gets in and out of her car she should be greeted with a lovely scent. This is the carrot I had on the stick last summer when I was working so hard on my house. "Get all this interior stuff done and you can play all next summer in the yard," I kept telling myself. Hopefully my house will behave and I really can spend my summer toiling in the backyard. Fingers crossed!